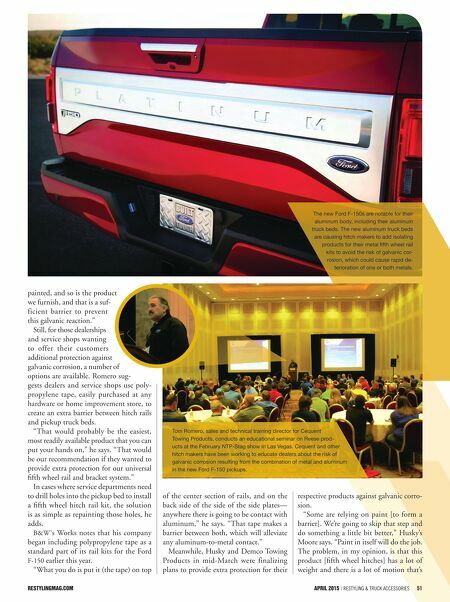 restylingmag.com April 2015 | Restyling & tRuck AccessoRies 51 painted, and so is the product we furnish, and that is a suf- ficient barrier to prevent this galvanic reaction." Still, for those dealerships and service shops wanting to offer their customers additional protection against galvanic corrosion, a number of options are available. Romero sug- gests dealers and service shops use poly- propylene tape, easily purchased at any hardware or home improvement store, to create an extra barrier between hitch rails and pickup truck beds. "That would probably be the easiest, most readily available product that you can put your hands on," he says. "That would be our recommendation if they wanted to provide extra protection for our universal fifth wheel rail and bracket system." In cases where service departments need to drill holes into the pickup bed to install a fifth wheel hitch rail kit, the solution is as simple as repainting those holes, he adds. B&W's Works notes that his company began including polypropylene tape as a standard part of its rail kits for the Ford F-150 earlier this year. "What you do is put it (the tape) on top of the center section of rails, and on the back side of the side of the side plates— anywhere there is going to be contact with aluminum," he says. "That tape makes a barrier between both, which will alleviate any aluminum-to-metal contact." Meanwhile, Husky and Demco Towing Products in mid-March were finalizing plans to provide extra protection for their The new Ford F-150s are notable for their aluminum body, including their aluminum truck beds. The new aluminum truck beds are causing hitch makers to add isolating products for their metal fifth wheel rail kits to avoid the risk of galvanic cor- rosion, which could cause rapid de- terioration of one or both metals. respective products against galvanic corro- sion. "Some are relying on paint [to form a barrier]. We're going to skip that step and do something a little bit better," Husky's Moore says. "Paint in itself will do the job. The problem, in my opinion, is that this product [fifth wheel hitches] has a lot of weight and there is a lot of motion that's Tom Romero, sales and technical training director for Cequent Towing Products, conducts an educational seminar on Reese prod- ucts at the February NTP-Stag show in Las Vegas. 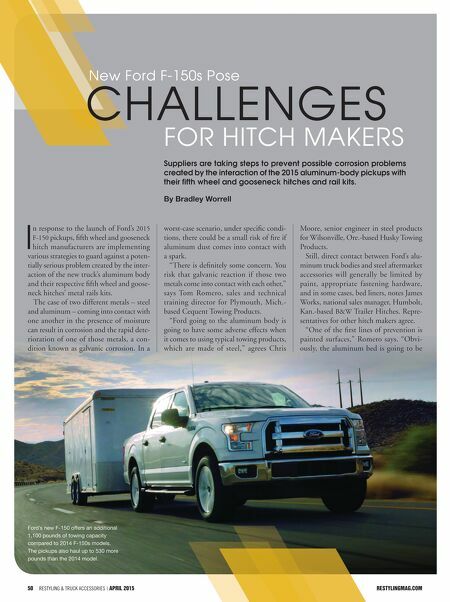 Cequent and other hitch makers have been working to educate dealers about the risk of galvanic corrosion resulting from the combination of metal and aluminum in the new Ford F-150 pickups.